One third of Mount Kilimanjaro's ice fields have completely melted in the last two decades and the rest of the mountain's ice could disappear by 2015, says Lonnie Thompson, a professor at the us -based Ohio State University, who made an aerial survey of the mountain's peak. He attributed the cause to global warming. Situated in northeastern Tanzania, near the Kenya border, Kilimanjaro is the highest mountain in Africa. Thompson warned that the disappearance of the mountain's ice fields might affect drinking water supply, agriculture and hydroelectric production. It will also put an end to the efforts of climatologists to deduce past climate by examining core samples of glaciers. 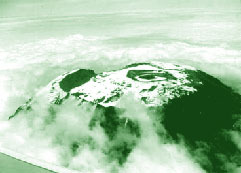 Thompson's survey compared with previous mapping shows that 33 per cent of Kilimanjaro's ice has disappeared since 1980. Since 1912, at least 82 per cent of the ice has gone.